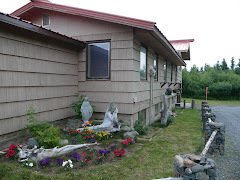 Over the years the Dillingham, Alaska Mission of Holy Rosary has acquired some very beautiful art. 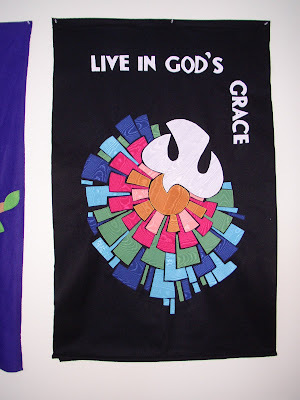 Some is authentic Alaskan Native art, some has been purchased by local artists, some of the art has been painted a Sister who lived at Holy Rosary, and some art was created by Holy Rosary parishioners. (Click on pictures to make larger). 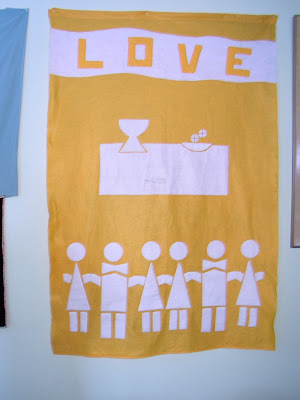 When the new Holy Rosary church (1985) was being built, an Alaskan Native artist painted this scene on the wall right above the entrance to the church. Here is a picture of Our Lady of Guadeloupe that is located in the basement of Holy Rosary. A duplicate of this framed picture is hanging in the basement at Saint Theresa in Naknek/King Salmon. 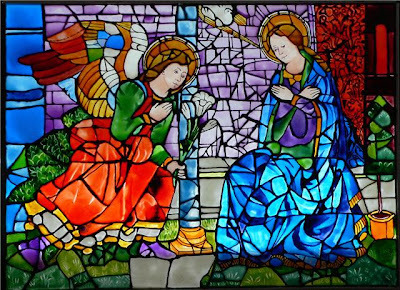 The annunciation was donated and created by Matteo Guarino in August of 2008. 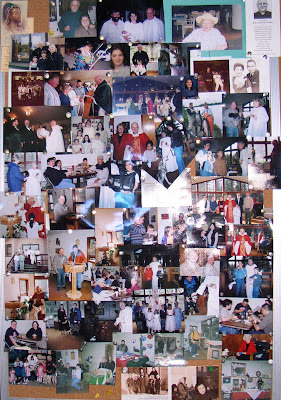 The collage are pictures taken at Holy Rosary from about 2000 to 2005. One of the Sisters in the 1970’s, an administrator at Holy Rosary, painted this picture of the old church that was built after a fire destroyed the main church. This old church is still a standing structure on the 10 acres of Holy Rosary property. The same sister painted the picture of the small airplane in the storm. 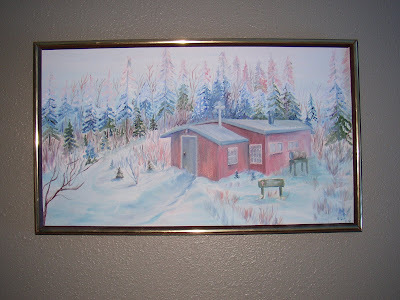 She painted a picture of one of the experiences she had while traveling in a small plane from Anchorage to Dillingham. A stormy fligt to Dillingham...but there is hope! Here is a beautiful framed picture of an Alaskan Madonna painted by an unknown Alaskan Native. 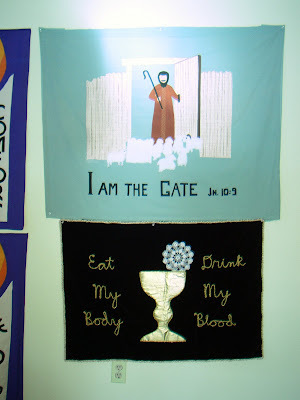 It hangs above the entrance to the church. 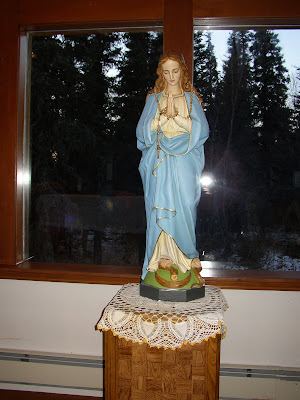 This statue of Mary is a much loved piece of Art. Parishioners who visit Holy Rosary remember it from over 40 years ago. It has been repainted several times and sits in the front of the church to the right of the crucifix. 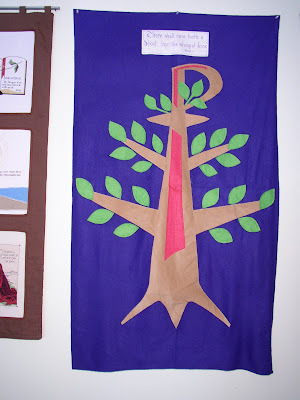 Here is an ecumenical banner made by parishioners. It represents all of the churches in Dillingham and is displayed during the blessing of the feet each year. 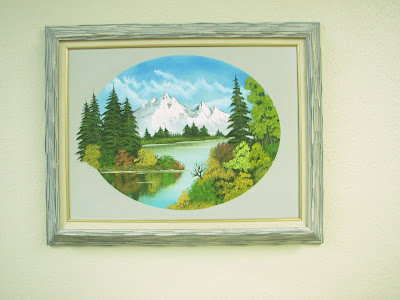 Here is a mountain scene painted by Gary Richardson, a local Dillingham artist. 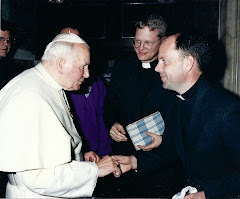 Here are pictures of administrators and priests who have served the Holy Rosary mission. Art is a necessary part of any church. Art adds wonder, mystery, peace, and tranquility to make for a memorable spiritual experience. Thank you to all who have donated and created this beautiful art. It is amazing how God works in our Catholic Church. The same day one of our Catholic members died, we baptized another into our faith. William Tennyson died early morning on June 12, 2009. William was a tremendous loss to our community. After praying with the family, I climbed in my Cherokee Warrior II and flew the short 10 miles across the mouth of the Nushigak River to Clarks Point for an infant baptism. We gathered at Saint Peter the Fisherman, June 12, 2009 at 11:30 AM to baptize Samuel James Slattengren, born in Dillingham, AK, Jan 10, 2009. The small fishing village was a bit sleepy that morning, but there were some 20 to 25 people that attended the Mass/Baptism. Mariano had a warm fire burning in the wood stove and there were an assortment of cup cakes, smoked salmon, and breads for the reception afterwards. From left to right, Mariano (Godfather) awaits the start of Mass as Justine (Godmother), holds baby Samuel. Next is Samuel's mother, Brittany. To welcome baby Samuel into Saint Peter the Fisherman community, parishioners traced the sign of the cross on his forehead. Samuel is anointed on the breast bone with the oil of Catechumens. The family prepares to have baby Samuel baptized. Samuel is baptized in the name of the "Father, and the Son, and the Holy Spirit." Even though the blessed Holy Water was a little cold, there was not even a peep out of Samuel! After being anointed with the Sacred Chrism oil, Samuel is a happy camper. Mariano and Justine held the candle, which represents the light of Christ. Mom gets a special blessing. Happy Godparents holding the newly baptized. The proud parents and godparents pose for a picture after the baptism. Brittany holds Samuel, the newest member to our catholic community. Brittany, thank you for allowing me to baptize your son Samuel. It was an honor to be asked! Please email me to set up a visit/Mass! What parishioners see from the pews inside Holy Rosary is spectacular. 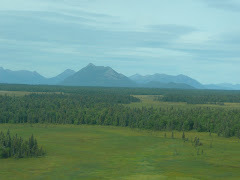 When they sit down they are rewarded with a peaceful view of the Alaskan wilderness. The view, aided by several large windows, help to create a spiritual atmosphere. Holy Rosary Mission parishioners drive through blizzards, snow, ice, and extreme winds to get to Mass. 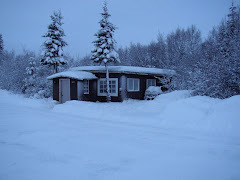 Depending on the village location, some use four-wheelers or snow machines. 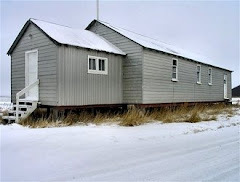 Parishioners in the larger communities, such as Dillingham and King Salmon, have cars and trucks that have arrived on a cargo plane or boat. 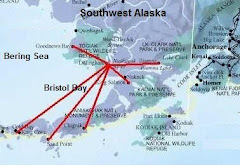 There are approximately three barges per year that sail around the Aleutian Chain to Bristol Bay. Because of the rugged living conditions, clergy in the past have been transitional and our parishioners have had to take ownership of their churches. Determined Catholic parishioners have learned to give flawless communion services, clean up flooding basements, keep the grass mowed, patch chuck-holes in the parking lot, and basically take charge of anything that needs done. For example, Holy Rosary, has a cleaning list posted in the vestibule that is always full a year in advance. 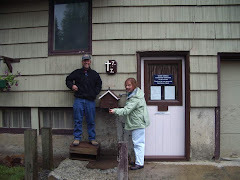 Our faithful and spirited parishioners have allowed Catholicism to remain a viable religion in the Alaskan Bush. 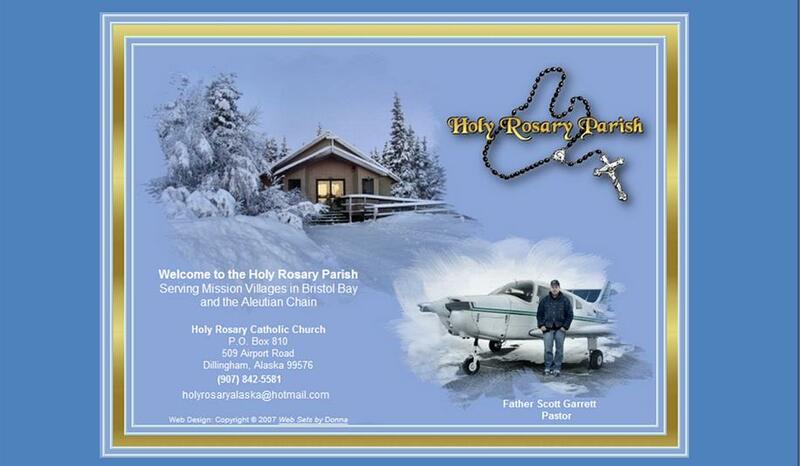 Located in Dillingham, Alaska, Holy Rosary church congregates on ten acres of land near the Dillingham Airport. It is considered a Mission Parish, hence the confusion of calling it a mission or a parish. The church building at Holy Rosary was built in the 1980's with funds from several generous local parishioners and the Catholic Extension Society. 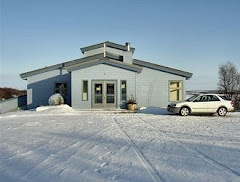 It is located on the West end of a one acre gravel parking lot. The building was designed and constructed by local contractors. 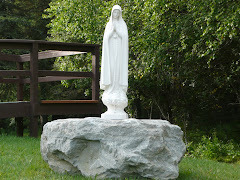 Built in the 1940,s, the Holy Rosary rectory is located on the East end of the parking lot. 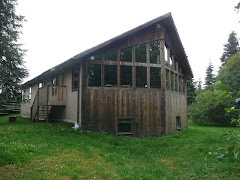 It is a three bedroom structure with basement and garage. Between the church and the rectory is the old church, which was used after a fire burned down the original church building. Plans are being made to repair this church so it can be used for meetings and fund raisers. The Holy Rosary Parish Mission consists of two other church buildings located in King Salmon and Clarks Point. Additionally, over twenty villages are considered part of the mission. Mass in these other villages is normally held in houses, schools, or fish canneries. There are no roads leading to or from any villages in the Holy Rosary mission territory. Any personal contact made to these Catholics must be done by air. 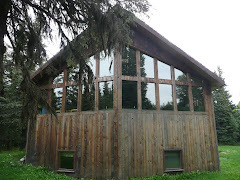 Please click here for more detail about the History of this important Alaskan mission. Father Scott is the Pastor of the Holy Rosary Mission and (unofficially) he ministers to the largest parish in the world. And although geographically he covers a vast area, the total number of families in his parish is approximately 150. When not in flight, Father Scott stays busy maintaining a church, rectory, and cemetery on ten acres of property. Within the larger Dillingham community he may be found ministering to a sick person at the Kanakanak hospital , eating lunch at the Dillingham Senior Center, blessing the fishing fleet, or attending an althletic event or graduation ceremony. One of the important services Holy Rosary provides for the community of Dillingham is drinking water. The well at Holy Rosary is probably the purest, cleanest, and coldest in Dillingham. Many Dillinghammers do not have good water and people from all walks of life line up at our pump to fill up on water. 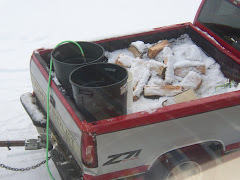 They fill up buckets, trash cans, jars, and water bottles. Basketball teams line up as do sports fisherman and airport personnel. Since many people in Dillingham do not even have water, they have come to depend on the well at Holy Rosary. The late Jim Kelly blessed the entire well. Most people who get water at Holy Rosary all know the water is blessed. Near the well, a sign is posted asking people to slip a small donation inside the mail slot on the door to help pay for electricity and maintenance. 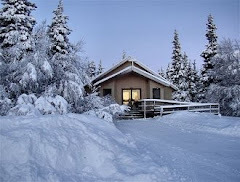 Subscribe via email to holyrosaryalaska.org. Receive automatic secure updates.